Mangosuthu University of Technology (MUT) honorary fellowship recipient has reminded graduates to act with integrity in their respective careers to set an example for younger people who see them as their beacon of hope. 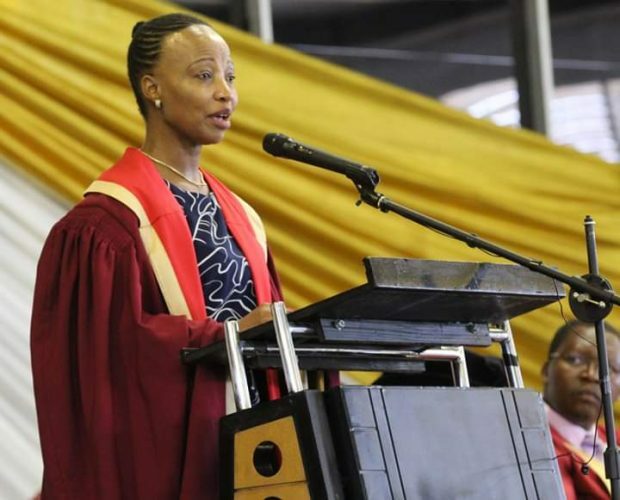 Speaking at the first MUT 2019 graduation ceremony on Tuesday (9 April 2019), Surveyor-General of the KwaZulu-Natal Province, Nondwe Monyake, told graduates that integrity meant acting ethically and doing the right thing at all times. This is followed by respect for time as a virtue, an important practice especially for graduates who are about to enter the world of work where they are expected to be on time. However, integrity stretches further to the character of individuals and how they should carry themselves. Signs of integrity are often mundane activities that are taken lightly and treated as not being important although they say a lot about the individual. Her message comes at an important time in South Africa where the country is witnessing a leadership vacuum characterised by business and political leaders being hauled to courts and commissions of inquiry over allegations of corruption, unethical practices and lack of integrity. Monyake dedicate her MUT honorary fellowship to the Chief Surveyor-General, Mmuso Riba, whose dedication to transformation has shaped the relationship between MUT, other universities and the Department of Rural Development and Land Reform. Getting an MUT honorary fellowship was a sentimental moment for Monyake because of her father’s friendship with Prince Mangosuthu Buthelezi, MUT’s founding father.